• Sen. Carl Levin, D-Michigan, advocates a "much more limited mission"
• Sen. Jon Kyl, R-Arizona, says such a move would be the "worst of all worlds"
WASHINGTON (CNN) -- The 2002 authorization for use of force in Iraq is among the arguments the war's supporters use to condemn congressional critics of the conflict. If Democrats have their way, it may be replaced. Democratic senators are talking Monday about revising the authorization Congress passed more than four years ago. They would do so by working to pass a new resolution putting additional restrictions on military action in Iraq. Senate Democratic leaders tentatively have agreed to try to modify the 2002 resolution, two senior Democratic aides told CNN. On Sunday's political talk shows, Democrats chatted up the idea of revising the Iraqi war authorization. "I've been working with some of my colleagues to try to convince them that that's the way to go -- to repeal and restate the president's authority, make it clear that the purpose that he has troops in there is to, in fact, protect against al Qaeda gaining chunks of territory, training the Iraqi forces, force protection, and for our forces," Sen. Joe Biden, a 2008 presidential hopeful, told CBS' "Face the Nation." Sen. Carl Levin, D-Michigan, also told "Fox News Sunday" that "we can have a much more limited mission that we authorize." Meanwhile, Sen. Hillary Rodham Clinton, D-New York, announced her own plan. Clinton has made a promise to end the Iraq war part of her 2008 presidential campaign. She is one of many Democrats calling for "phased redeployment" to remove many U.S. troops from Iraq. "It's time to say that redeployment should start in 90 days, or the Congress will revoke authorization for this war," Clinton said a video posted on her campaign Web site. The House passed such a resolution Friday. "The next resolution will force the president to change the strategy," Sen. Chuck Schumer, D-New York, said Monday on CNN's "American Morning." Schumer said he believes more Republicans will join Democrats in working to pressure the president "because his strategy is misguided." Seven GOP senators crossed the aisle to vote with lawmakers who oppose the troop buildup in Saturday's 56-34 vote -- four short of the 60 needed for a vote to go forward. Seventeen Republicans joined Democrats in passing the House resolution last week. 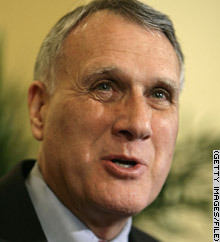 But Sen. Jon Kyl, R-Arizona, said a vote for a new Iraq war authorization would be a "huge mistake, in my view, when we are just beginning to execute a new strategy." He said U.S. commanders and Iraqi leaders share "cautious optimism" that Bush's plan to beef up security in Baghdad can work. A vote in Congress that might stop that effort would be the "worst of all worlds," he said, likening any such move to pulling the rug out from under U.S. troops at the "very moment we're finally finding the strategy for victory." Other proposals are on the table as well. Democratic Sens. Chris Dodd of Connecticut and Barack Obama of Illinois, who also are presidential candidates, already introduced bills that would require congressional authorization for more troops in Iraq. In speeches leading up to November's midterm elections, Bush argued against sending more troops to Iraq. The elections gave Democrats control of both houses of Congress. Sen. Jon Kyl, R-Arizona, said U.S. commanders and Iraqi leaders are cautiously optimistic about President Bush's plan to send more troops to Iraq.